Join us in exploring the diverse habitats of the Boulders. 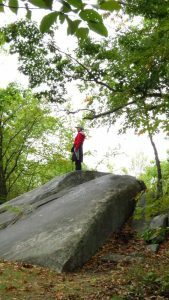 Description: Hike 4.5 miles through beautiful forests and wetlands and have lunch at The Boulders! Please bring lunch, water and appropriate footwear. Directions: From Pittsfield, take Routes 8/9 east towards Dalton. Take a left onto Park Avenue. Take another left onto Gulf Road in about 0.5 miles. Trailhead parking is 0.25 miles ahead on the left. Email mleavitt@bnrc.org with any questions!